SP25M CMM Scanning Probe - CMM Inc.
At only 25 mm in diameter and with incomparable flexibility, it’s no wonder that the SP25M is one of the world’s most compact and versatile scanning probe systems on the market. With the SP25M, users can scan for form, position and size by using a wide range of scanning and touch-trigger modules that are built into the probe system. The SP25M delivers high accuracy of discrete points and it also has two sensors in one - scanning and touch-trigger. Users can use a choice of five scanning modules (which can carry M3 styli with lengths from 20 mm to 400 mm) or alternatively, the user can use an adapter to carry Renishaw’s TP20 range of touch‑trigger probe modules. The SP25M's is compatible with the PH10M/MQ and PH6M probe heads and it can also be mounted on a multiwired extension bar. SP25M requires that a non-linear, third-order polynomial calibration method is used. A range of SP25M module kits are available to suit a user’s application and to build up their probing capability over time (these include entry‑level kits for touch‑trigger users and full combination kits). Each SM25 scanning module is enhanced for gain and spring rate, to suit the range of stylus lengths specified. For every module, there is also a matching SH25-# stylus holder. The SH25-3 and SH25-4 stylus holders are constructed with a fixed carbon fibre stem to which an M3 stylus is mounted, to provide the correct working length. 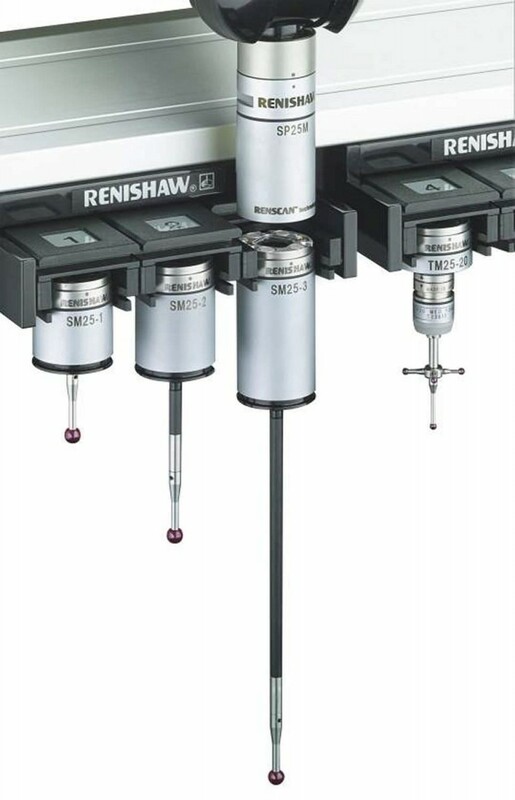 Please note: Although the SP25M can carry cranked (non-straight) styli configurations when using SM25-1/2/3/4/5 scanning modules and the original standard stylus holders (SH25-1/2/3/4/5), for optimum metrology where larger offsets are required, Renishaw recommends the new SH25-2A/3A/4A range of stylus holder, specifically designed to meet the challenges posed by such stylus arrangements. To be used with TP20 touch-trigger modules and extensions. A range of FCR25 module changing systems, each of which allows any of the SP25M system elements to be stored in each port. 3-port stand-alone unit for smaller CMMs and optical CMMs. 6-port stand-alone unit for smaller CMMs and optical CMMs. PA25-SH and PA25-20 inserts to store SH25-# stylus holders or TP20 probe modules. The AC3 interface card is designed for use where a PC or OEM Controller (ISA Bus) provides control of the CMM system. The card performs probe management functions. Please contact us to aquire the full list of the currently available SP25 probe kits.